We had been driving for at least an hour. My mother’s new ukulele Christmas CD was finishing its second loop over the speakers. “Oh Come Emanuel” in its serious, ethereal glory seemed a bit out of place on a tropical island, but in this rendition, the four-strings of the “uke” suitably blended the song with our surroundings. My mother appeared content, her eyes gazing out at Kauai’s southwestern shoreline, a soft smile on her face. I was at the helm of the largest and “most spacious” rental van that I could find. My mother sat next to me, paying more attention to the scenery and music than to her role as navigator. Behind us sat my sister Haley, her partner Angie and further back in the last row of the van, my seventy-nine year old grandmother. A few months previous during the planning of the trip, my mother called me. “It’s going to be a lot of work, and I can’t do it alone. Will you come?” From the beginning, I knew what my role would entail. Not only was I the son, the brother, the grandson, but due to the nature and necessities of the trip I had to become also the chauffer, the heavy lifter, the caregiver. Ultimately, this trip was for my twenty-six year old sister, who sitting in her car seat in the middle row of the van was somewhat unsure about our current voyage and destination. “Why is this road so curvy?” she asked not being able to see out the windows due to her short stature and limited mobility. Her condition is congenital and chronic. Genetically weak bones force her into a state of dependency. On this trip, that dependency was placed squarely on the backs of my mother and myself. The combination of flights, security checkpoints, four days of island driving, and frequent lifting from wheelchair to car seat was taking its toll on my lower back. Each time I lifted, I would do my best to calm her nerves and fears, which had been tested over the years by mishaps, broken bones, and hospital stays. The ocean was calm, almost glassy, as we made our way west past the town of Waimea. We drove by a small crafts fair. Men in Hawaiian shirts and woman in large sunhats walked casually from vendor to vendor looking for a way to pass the time and a treasure to remind them of their fleeting island experience. Eventually we turned right up Route 550 and began our ascent to the Waimea Canyon observation area. After miles of winding road and another full loop of the CD, we arrived at the State Park. Wild chickens walked past, their heads bobbing in rhythmic motion unafraid of the wheelchair’s 4 wheels and awkward bars that descended from the back of the van. My mother and grandmother walked ahead as I pushed my sister up smooth concrete switchbacks toward the top edge of the viewing platform. 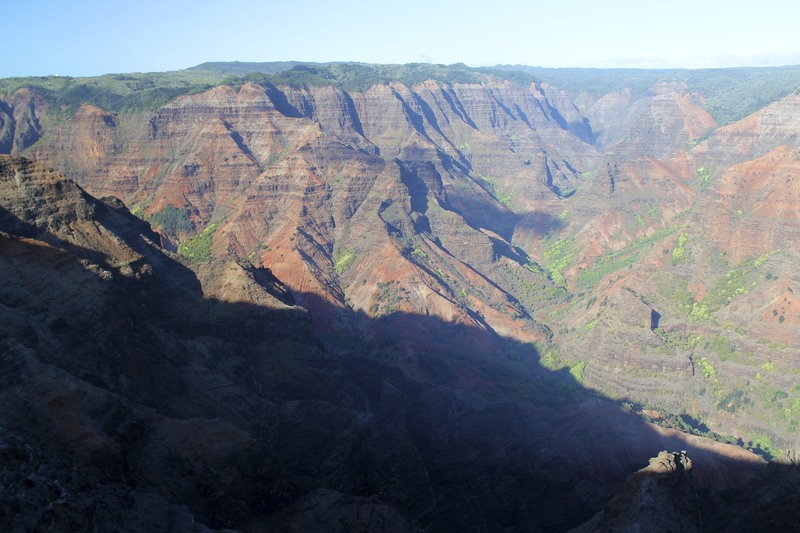 At Waimea Canyon where eons of upheaval and erosion have sculpted the landscape into a natural cathedral, we paused together gazing out into the abyss. Not many words were spoken, and it didn’t last long. But, in those few moments as I observed my family immersed in this fantastic landscape I became overwhelmed by a sense of gratitude and purpose. The opportunity to share this with my sister, whose everyday life is defined by limitation and dependency, was a true gift. Looking into the geological vastness with her I felt limitations momentarily lift, vanishing into the stillness and strata of the canyon. It became clear that my role was not only that of a brother and caregiver but also a facilitator. My purpose on this journey was to help facilitate this kind of experience: the experience of wonder, the experience of awe, the experience of freedom.